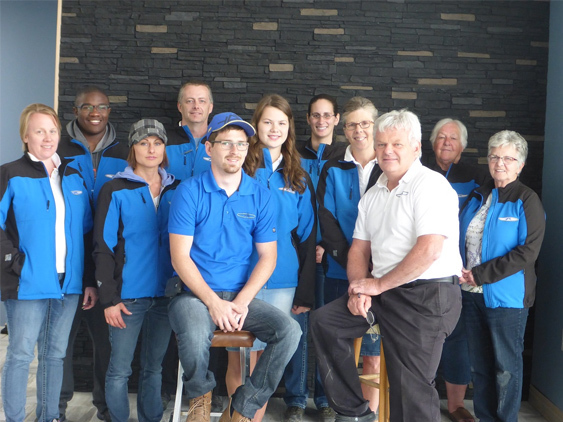 Yorkton Auction Centre | Learn more about our team. 2009 saw the beginning of Yorkton Auction Centre, taking over the facility that previously housed Stampede Auctions. Since that time Yorkton Auction Centre has seen steady growth, allowing them to invest in the future with a state of the art facility in 2016. Yorkton Auction Centre is proud to be family owned and operated. When you choose Yorkton Auction Centre you become family and get a sales staff that understands your needs. Yorkton Auction Centre is a local company with a global reach. Paul has been auctioning for 20+ years. The first several years were spent in the livestock industry selling cattle. Since 2009 Paul along with his wife Shannon have been owners of Yorkton Auction Centre. Paul’s enthusiasm goes back to when he was a child; when he would often attend the local auction with his father. These visits to the sale barn gave Paul the dream to one day be an auctioneer. Paul attended auction school in Strathmore,Ab in 1985. Paul is also a certified appraiser for personal property. Keep it simple is Paul’s motto. Jamie’s younger years were spent in auction barns and on the road with Paul. Hearing the auction lingo day in and day out has made Jamie an exceptional young auctioneer. After graduating from high school in 2011, it was only natural for Jamie to start full time at Yorkton Auction Centre. Jamie is constantly looking to expand his knowledge in the auction industry. Customers are number 1 priority to Jamie, and bringing a professional service to both the buyer and seller is what he strives to achieve. Jamie along with his wife Leanna plan to continue the Family business. Trent joined the Yorkton Auction Centre team in 2016 in the role of sales manager. Born and raised in the Yorkton area Trent owned a diesel shop for 20+ years, allowing him to create many contacts and friendships in the Yorkton and surrounding area. He possesses great salesmanship as well as attention to detail and strives to make your auction seamless and professional. Trent enjoys spending time with family and friends, as well as farming the family farm. David joined the Yorkton Auction Centre team in Spring of 2017. After spending the last 7 years overseas David and his wife returned home to Yorkton, Sk. 2017 was our introduction to Online only auctions and David agreed to take on the challenge of growing this area of our business. David brings many years of sales experience and is also tech savvy.